BML Heel Lifts are developed for the purpose of compensating for leg length discrepancies when used individually, or elevating the heel when used in tandem. When used in one shoe at a time, the lifts help restore pelvic balance and eliminate rotation of the lumbo-sacral spine caused by unequal leg length. When used in both shoes at the same time, they can provide balanced elevation. BML Heel Lifts provide excellent shock absorption and can be stacked for a custom amount of lift. These lifts are easily cut to size with sharp scissors. Brown (D40) - Soft, with plenty of yield under impact, yet supportive. Surface is high friction, almost non-slip. 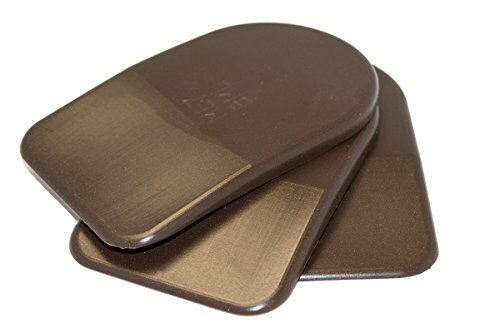 BML Heel Lifts are developed for the purpose of compensating for leg length discrepancies when used individually, or elevating the heel when used in tandem. When used in one shoe at a time, the lifts help restore pelvic balance and eliminate rotation of the lumbo-sacral spine caused by unequal leg length. When used in both shoes at the same time, they can provide balanced elevation. BML Heel Lifts provide excellent shock absorption and can be stacked for a custom amount of lift. These lifts are easily cut to size with sharp scissors. Brown (D40) - Soft, with plenty of yield under impact, yet supportive. Surface is high friction, almost non-slip. Manufacturer: BML Basic Physicians Supply, Inc. Publisher: BML Basic Physicians Supply, Inc. Studio: BML Basic Physicians Supply, Inc. If you have any questions about this product by Basic Mold Labs (BML), contact us by completing and submitting the form below. If you are looking for a specif part number, please include it with your message.